Anyone who has ever visited a beach can see that shorelines are a dynamic thing. They change frequently. Sometimes gradually, sometimes very quickly (like after a major storm)! Wave action, prevailing currents, storms, and anthropogenic modifications all play a factor. In Manasquan, beach erosion is amplified as a result of "New Jersification". 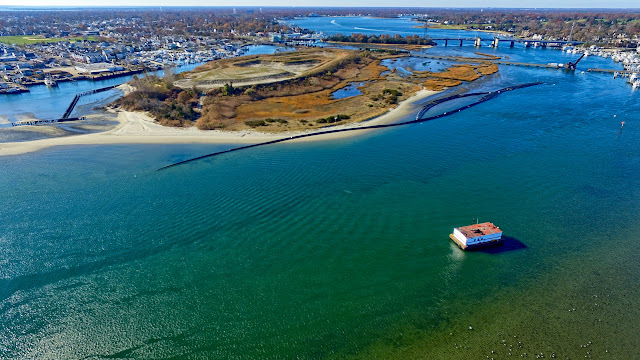 The hard jetties of rocks and wood that were originally intended to help curb erosion and keep things like the Manasquan Inlet open, turn out to in fact have a negative impact on the health of the beach. In this section of the Jersey Shore, there is a prevailing northward longshore current. The current naturally carries sand from the south of the beach and deposits it to the north. The problem in Manasquan, starts with the Manasquan Inlet. 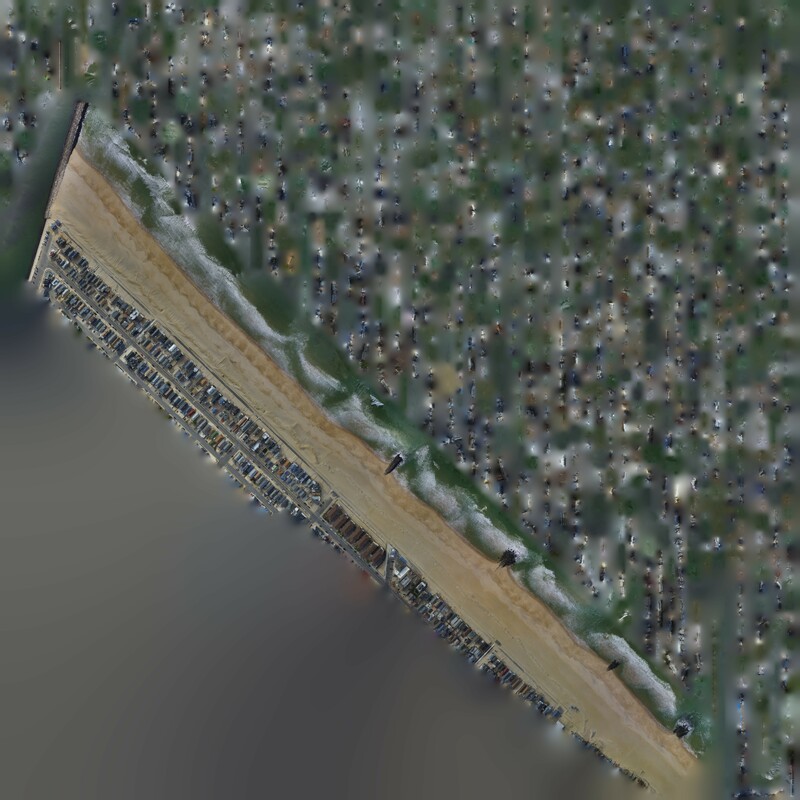 This is immediately apparent when you just look at both the Point Pleasant and the Manasquan sides of the inlet from the air. 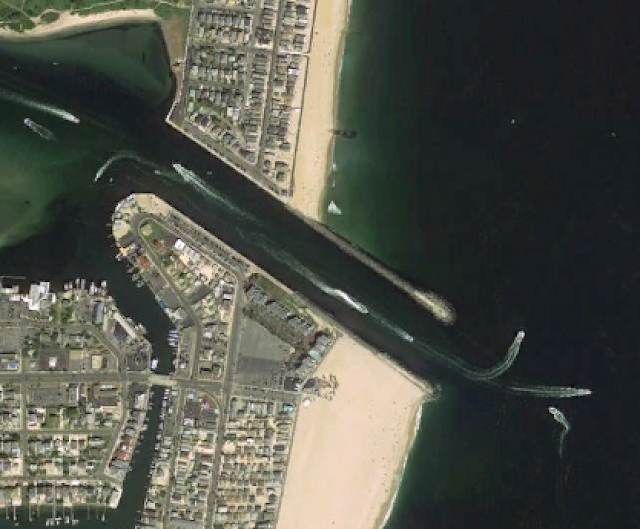 Manasquan Inlet with Point Pleasant to the south and Manasquan to the north. Courtesy of Google, Inc. 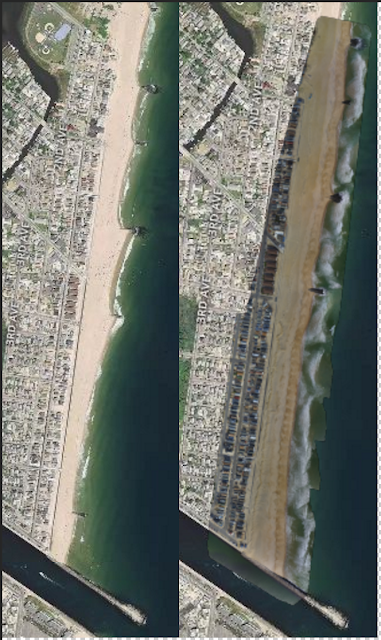 The shot above was taken the summer after Hurricane Sandy, before the beach replenishment was done. The difference is dramatic. The sand from the south has completely built up on the Point Pleasant side, and on the Manasquan side, the sand along the inlet on the surfer's beach has eroded significantly. This situation will continue as long as the sand from the south is blocked by the inlet. The only relief is the costly, time consuming beach replenishments that the Army Corps of Engineers undertake, when funding is available, typically once a decade. 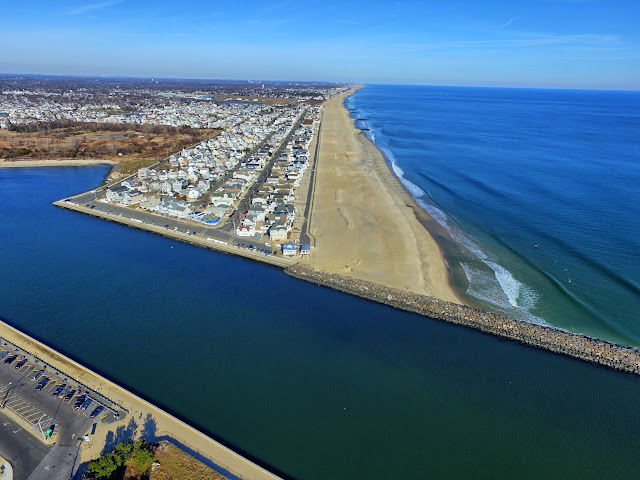 Keeping a healthy, wide beach is literally the first line of defense against wave action and storm surge for the community in Manasquan, and that is why it is important to monitor and maintain this precious resource. To monitor, we need to collect data and that is exactly what I hope to do with my drone and a generous non-profit grant from Maps Made Easy. The image below shows the difference between the beach in the summer of 2012 after Sandy, and the current state of the beach, going on 3 years since the most recent replenishment. I shared my pilot collection of Manasquan beaches with some colleagues who advised me to try to collect imagery as close to Mean Lower Low Water, which is the average height of the lowest tide recorded at a tide station each day during the recording period. I headed up to the beach to Pompano Avenue and flew at 200' AGL starting at Pompano from the Inlet north to Brielle Road. I currently only have one battery, so, this was the most I was able to capture in its 20 minute flight time. I then raced home, charged the battery, and came back to Main Beach to fly the northern portion of the beach on the other side of the MLLW mark. Not ideal, I think I might need to invest in a second battery! I also discovered that doing this, with 2 different take off and landing locations, has a negative impact on the elevations that are generated by Maps Made Easy. Their staff is looking into supporting multiple takeoff locations, but unfortunately we can't do anything about this flight. The imagery is fine, but, the elevations are off by a few meters, so if you're looking to use this DEM, you'll need to know how to adjust it (tying it down to the NED or NJ LIDAR based 1:2400 scale DEMs for instance). 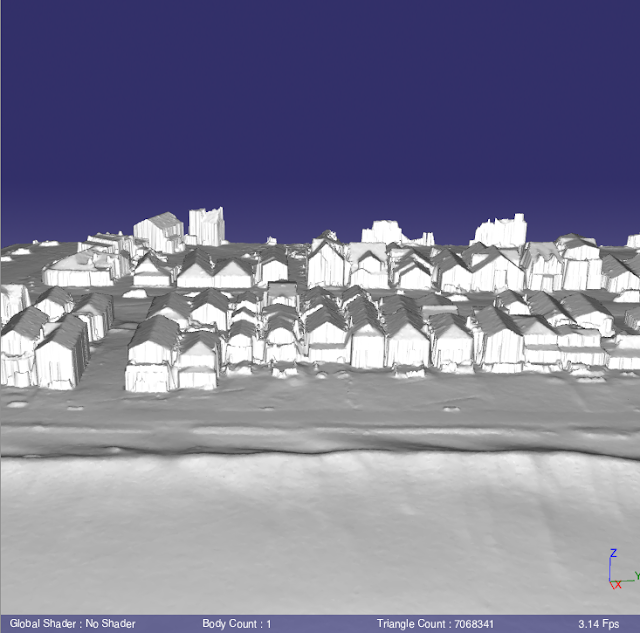 Still, there is value in this collection as a benchmark of beach width monitoring. Comparing the pilot area DEM to the NED and this new collection. The pilot area DEM and NED are very close, however, this current DEM is about 7 meters higher than it should be. The 3D model will look a bit worse than the pilot area for a simple reason; this is a lot larger area, but the preview is limited in terms of how many faces can be loaded into the browser without crashing your computer. So, larger area, same amount of faces makes it look worse. You'll also notice some craziness with the water - that is expected since the ocean is always moving so the structure from motion techniques used to build these models will have a very difficult time. 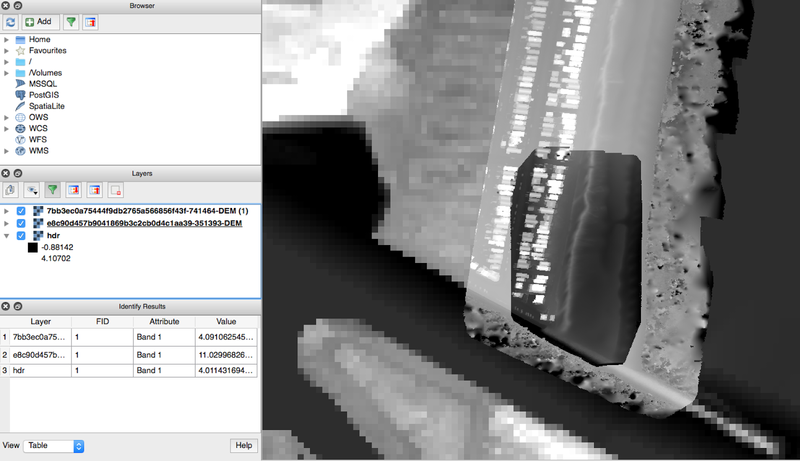 However, if you have desktop 3D software, you can still download the textures, materials and the object file to have a full resolution model offline. As with anything on this site, it is 100% free for non-commercial use, I just ask that you credit www.jerseyshoredrone.com. Explicitly, I want to make this demo data available free of charge for any Federal, State, or Local government, and all academic users. Again, special thanks to Maps Made Easy for their amazing software and granting an environmental, non-profit license for production and storage of this data.